Someone great once said, “Necessity is the mother of all invention” (Plato). Well, I don’t claim to be Plato, but I do have the High Honors of possessing “Necessity”. That brings me to my point. While Dad and I were working on this 1988 YJ project, we developed “necessity”. 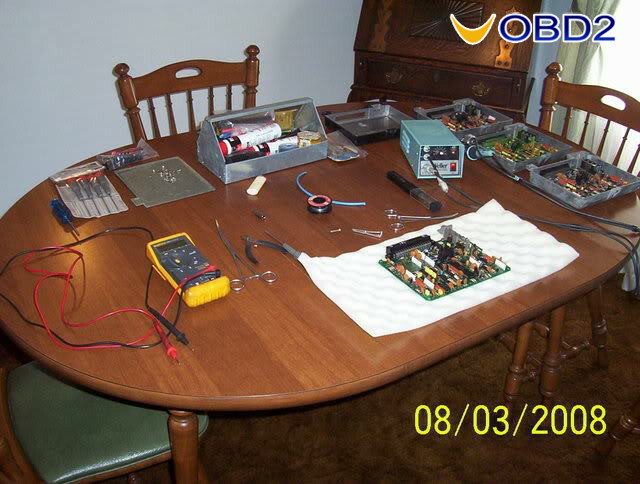 The Jeep was purchased with a suspect computer and wiring problem and in a non running condition. 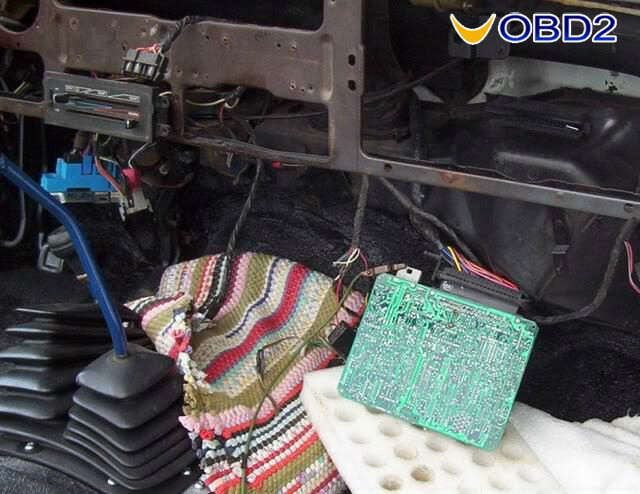 An eBay Wiring harness and ECU Chip Tunning tool made short work of that “no run state” and the project rolled on. 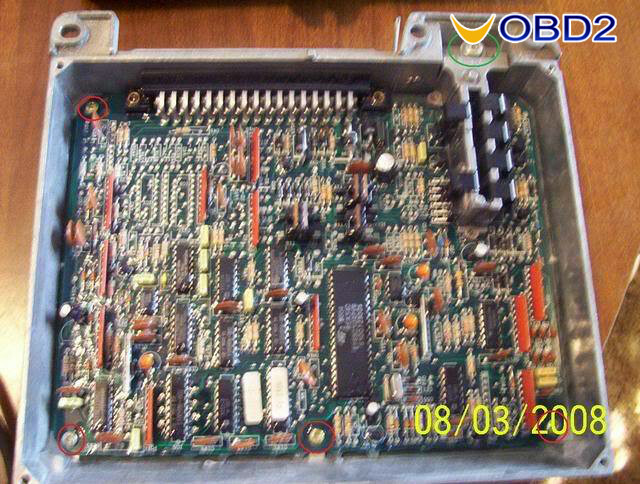 I would like to share what I found and what was done to REPAIR the ECU. If only one person can gain from this experience, I would feel like our blessing could be passed along to another in need. 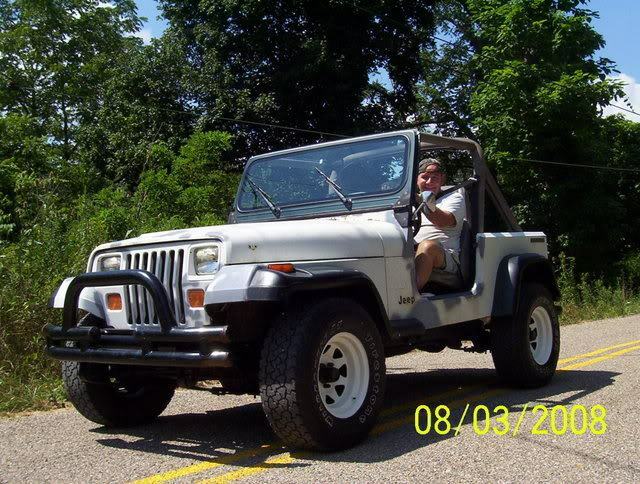 First the basics: 1989 YJ, 2.5 4 Cylinder, Throttle Body Injection, Manual 5 speed. Failure Symptoms: Fuel Pump Runs continuously with key turned from Off to ON position, No Spark, No Fuel Pulse at TB Injector. Early in the troubleshooting process I became fully convinced that the ECU was the point of failure. I eventually wound up having 4 ECU’s in hand and with nothing else to loose, coupled with the fact of being too stubborn to pay retail for a New Computer just to put it in and possibly toast it, (read no return on electrical parts) I had to go with my gut and crack them open. 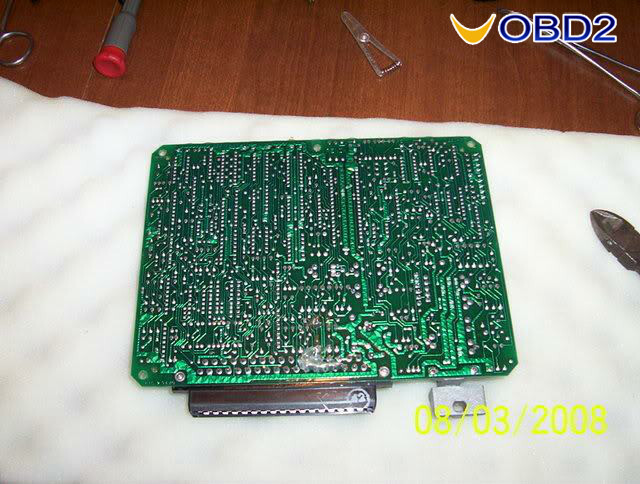 The ECU is removed from the mounting bracket and the back cover is removed. The cover is held on by four Torx 10 screws. 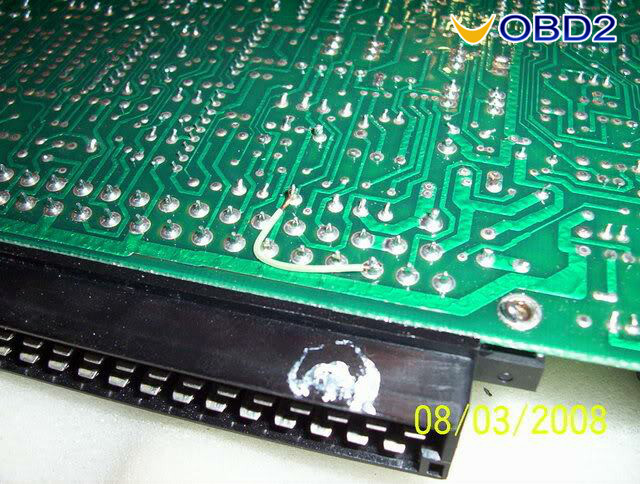 What I found in all cases was a heat damaged printed circuit board and or a diode. 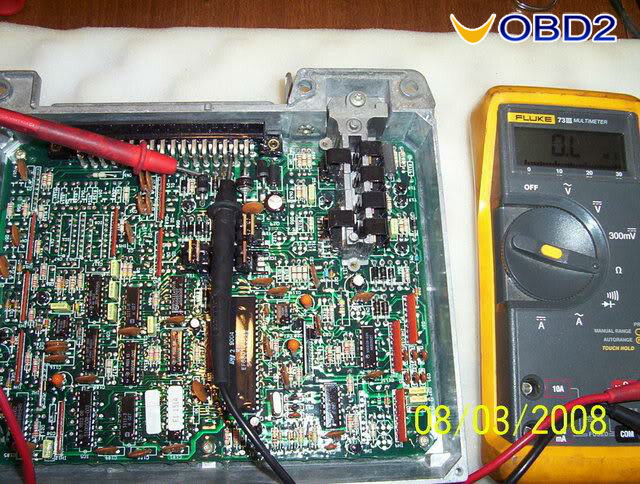 A Multi-Meter set to Ohm’s can confirm no continuity resulting in an open trace. 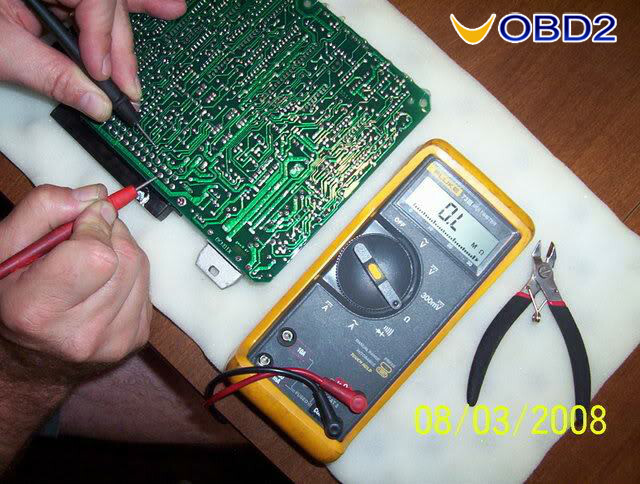 This can also be performed easier from the bottom of the board. 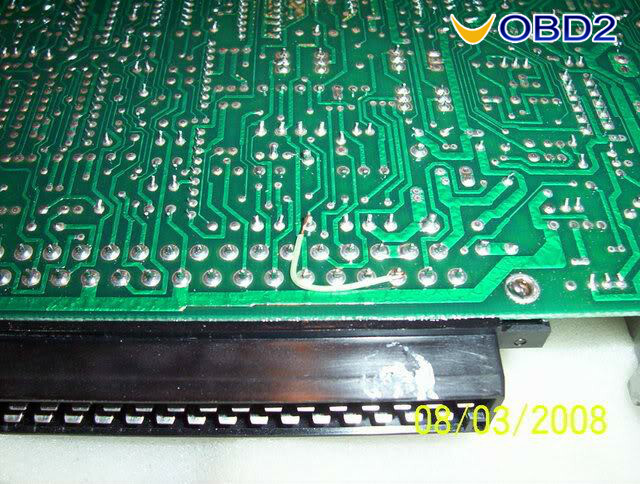 This is a picture of a damaged diode. 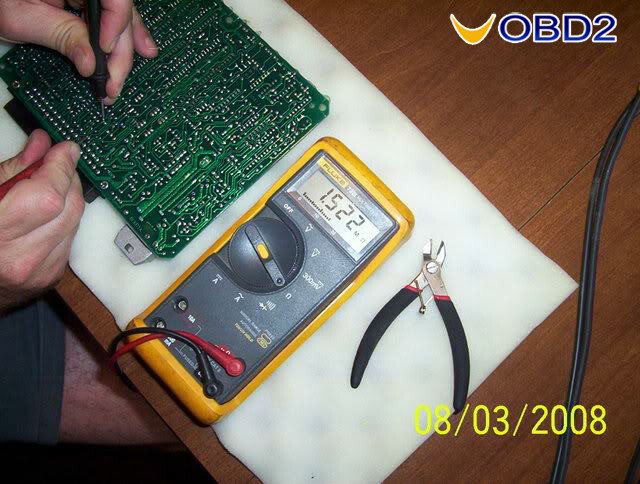 Picture taken after de-soldering from ECU. This metered a value of .492 and was BAD, another was metered “open”, also bad. 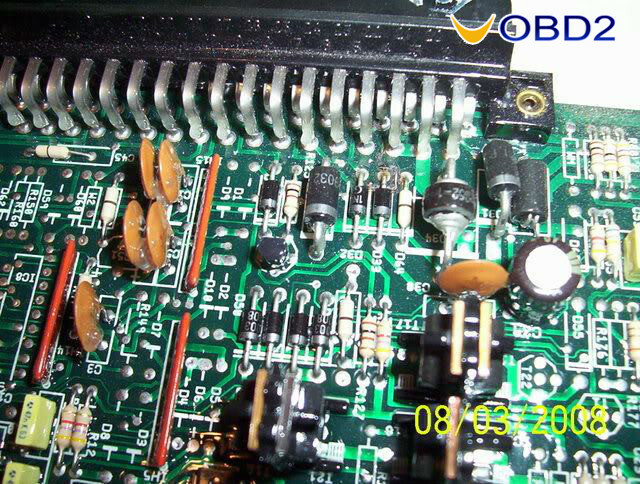 This is a GOOD diode, meter value at 1.522 and another measured the same, these were the two boards I repaired. The Renix remanufactured unit had a Heavy Duty looking diode installed when it was remanufactured, who knows when. 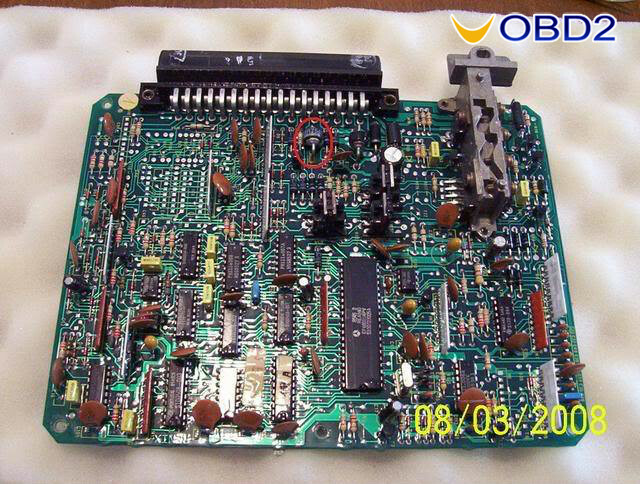 I quickly realized that if the printed circuit was restored, it was highly likely that all would be good! Time to repair the open trace. 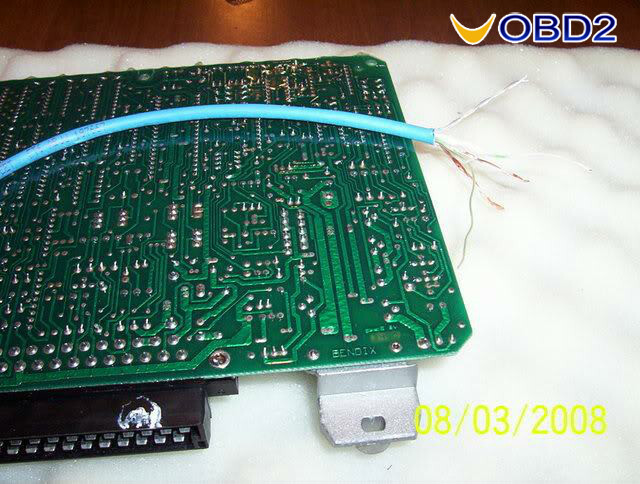 Carefully make a jumper wire from your choice stock, CAT5 in my case; this will be used to restore the open circuit. Lay it in and size it up to fit before soldering. Double check that you are making the correct connections! 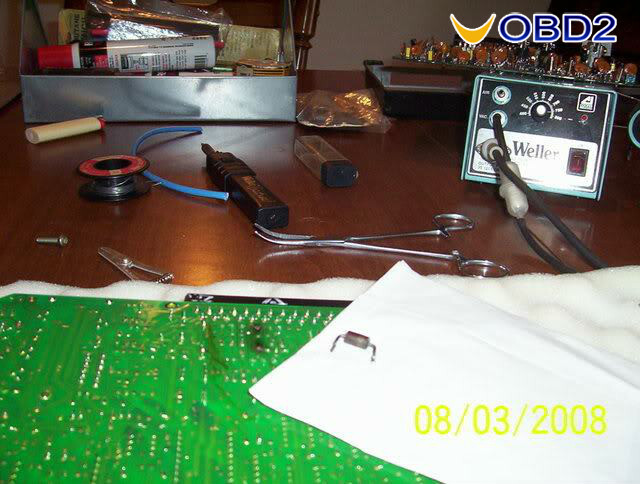 Here is the Jumper after being soldered to correct pins. A covering of Hot Glue provides both insulation and protection. And lastly a quick check to verify operation. If you’ve made it this far, I hope you are as blessed as we were! Running Jeep, Priceless! After testing, the unit was remounted into the outer case and reinstalled into the Jeep. 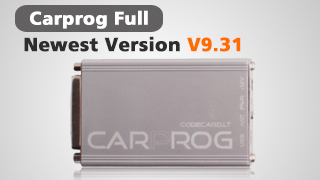 Two ECU’s repaired – the fix; using the repaired Trace method. I will be looking for replacement diodes to mount into the two remaining ECU’s. I am confident that this will resolve their conditions as well. I am also pretty certain that the weak connection or no connection at the starter relay main lug and the fusible links were the contributing factors in this particular failure. These were also completely redone while waiting for the mailman. Note: Pin 3 on the main ECU connector is identified in the FSM as Starter Switch.